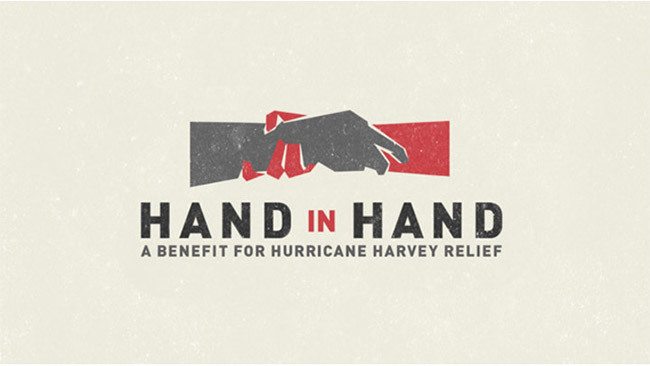 Hand in Hand: A Benefit for Hurricane Relief has announced additional celebrity participants, corporate partners and plans for expanded relief efforts to include those who may be affected by Hurricane Irma in addition to those affected by Hurricane Harvey. The one-hour special will air live and commercial free on Tuesday, September 12th from 8-9 pm EST on the East Coast and re-air 8-9 pm PST on the West Coast. Hand in Hand will be available in the U.S. on ABC, Bravo, CBS, CMT, E!, FOX, HBO, MTV, MTV2, MTV Live, MTV Classic, NBC and Oxygen in addition to live-streaming internationally via Facebook, YouTube, Twitter, AOL, Huffington Post and Yahoo starting at 8 pm EST during the first broadcast. Hand in Hand will feature appearances, performances, taped tributes and messages from some of the nation’s biggest stars including Anthony Anderson, Bun B, J Balvin, Beyoncé, Justin Bieber, Connie Britton, George Clooney, Andy Cohen, Stephen Colbert, Sean “Diddy” Combs, Terry Crews, Billy Crystal, Ellen DeGeneres, Robert De Niro, Drake, Hilary Duff, Jourdan Dunn, Jimmy Fallon, Jamie Foxx, Richard Gere, Tom Hanks, Marcia Gay Harden, Faith Hill, Kate Hudson, Dwayne Johnson, Joe Jonas, Catherine Zeta -Jones, Nicole Kidman, Karlie Kloss, , Matt Lauer, Jay Leno, Zion & Lennox, Jared Leto, Eva Longoria, Rob Lowe, Matthew McConaughey, Tim McGraw, Tracy Morgan, Norah O’Donnell, Gerardo Ortiz, Chris Paul, Tyler Perry, Dennis Quaid, Questlove, Jeremy Renner, Julia Roberts, Kelly Rowland, Adam Sandler, Ryan Seacrest, Blake Shelton, David Spade, Gwen Stefani, Michael Strahan, George Strait, Barbra Streisand, Sofia Vergara, Kerry Washington, Chandra Wilson, Oprah Winfrey, Rita Wilson and Reese Witherspoon with more to be announced. Strait, a Country Music Hall of Fame member who is leading the country music world in these efforts will perform directly from his benefit concert at San Antonio’s Majestic Theatre. The Michael & Susan Dell Foundation generously contributed five million dollars to the Hand in Hand telethon so all the money raised will go straight to families and communities in need. In the wake of Hurricane Harvey, the Dell Foundation recently launched the Rebuild Texas Fund in collaboration with the OneStar Foundation. Verizon has also partnered with Hand in Hand by providing a two and half million dollar contribution to the telethon, as well as orchestrating the 2,000+ call center volunteers stationed across the country who will make the telethon possible. In addition to ensuring the donations can be accepted and processed through their call centers, viewers can also have the option to make a $25 donation to the Hand in Hand Hurricane Relief Fund by simply texting “GIVE” to 80077 on their mobile phones. Comic Relief USA, the non-profit organization behind Red Nose Day and Idol Gives Back, will be responsible for collecting donations in addition to managing and distributing grants through the Hand in Hand Hurricane Relief Fund. Proceeds from the telethon will benefit the Rebuild Texas Fund, Direct Relief, Feeding Texas Habitat for Humanity, The Mayor’s Fund for Hurricane Harvey Relief (administered by the Greater Houston Community Fund), Save the Children and United Way of Greater Houston with more to be announced if the need expands due to Hurricane Irma. Digital, text and phone donations will all be accepted. Phone lines will be open at the beginning of the broadcast and close one-hour after the broadcast ends. Text and digital donations will be accepted for several days after the broadcast.